The Faisalabad Institute Of Cardiology Faisalabad Punjab. MBBS with MS or FCPS in the relevant subject or other equivalent qualification OR MBBS with a postgraduate qualification like DA or MCPS in Anesthesia with 2 years of practical experience in the relevant subject before or after postgraduation. MBBS and MD or FCPS (in a relevant subject or equivalent qualification OR MBBS and postgraduate qualification like DMRD or MCPS in the relevant subject or equivalent qualification with two years practical experience before or after postgraduation. MBBS with DSc or Ph.D or M. Phil or FCPS in the relevant subject or M. Sc (two years duration in the relevant subject or other equivalent qualification OR MBBS or M.Sc in the relevant subject with postgraduate qualification like Diploma in Clinical Pathology or other equivalent qualification with two years practical experience in the relevant subject before or after postgraduation. MBBS or equivalent Medical qualification from a recognized university and registered by PM&DC. One year house job. One year experience in the relevant field will be preferred. (a) Master Degree (at least 2 division or C grade) in Computer Science from recognized University. (b) One year Experience in Program writing. (a) MA / MSc (at least 2nd division or C grade in Statistics / Mathematics / Economics / Physics from recognized University. (b) Two years experience of Program writing. (a) Graduate (at least 2 division or C grade) with post graduate diploma in Computer Science (at feast one-year duration) from an Institute recognized by the Board / University. (b) Two years experience in program writing. Note: Previous Experience in Public Sector Cardiac Institute will be preferred. B.Sc Nursing Post RN with at least four years of practical experience at. Charge Nurse. B.Sc Nursing Generic with at least five years of practical experience as Charge Nurse. 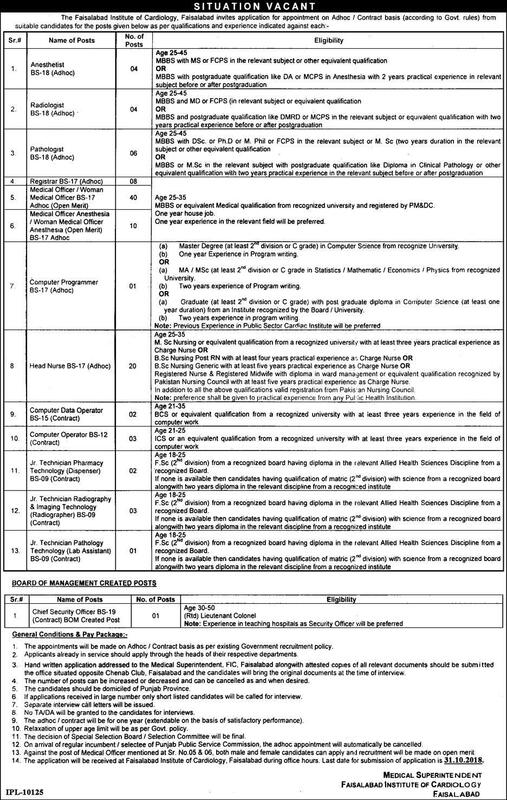 Registered Nurse & Registered Midwife with a diploma in ward management or equivalent qualification recognized by Pakistan Nursing Council with at least five years practical experience as Charge Nurse In addition to all the above qualifications valid registration from Pakis-an Nursing Council. Note: preference shall be coven to practical experience frorn any Public Health Institution. BCS or equivalent qualification from a recognized university with at least three years experience in the field of computer work. ICS or an equivalent qualification from a recognized university with at least three years experience in the field of computer work. F.Sc (2nd division) from a recognized board having a diploma in the relevant Allied Health Sciences Discipline from a recognized Board. If none is available then candidates having the qualification of matric (2nd division) with science from a recognized board along with two years diploma in the relevant discipline from a recognized institute. 1. The appointments will be made on Adhoc / Contract basis as per existing Government recruitment policy. 2. Applicants already in service should apply through the heads of their respective departments. 4. The number of posts can be increased or decreased and can be cancelled as and when desired. 6. If applications received in large number only shortlisted candidates will be called for interview. 7. Separate interview call letters will be issued. 8. No TA/DA will be granted to the candidates for interviews. 10. Relaxation of upper age limit will be as per Govt. policy. 14. The application will be received at Faisalabad Institute of Cardiology. Faisalabad during office hours. Last date for submission of application is 31.10.2018. FAISALABAD INSTITUTE OF CARDIOLOGY FAISALABAD.